The developmental history of 700 County Street/610 Green Street is unique, and a bit macabre. The County Street dwelling was built in the 1850s as a single family, wood clapboard home with a gracious wraparound porch. In 1898, a funeral home was constructed on the adjacent Green Street lot. By the 1920s, the man who lived at 700 County had taken over the funeral business. Then, coincident with the rise of the motor car, a series of garages were built between the two buildings to service the funeral home. It was at this point that work and personal life physically intersected, and a connector was established between the family dwelling and the cadaverous business. The buildings were adapted to new usage in 2008, as apartments and office space. CPG was contacted in 2012 to complete a follow up tax credit application, proposing that the office space, on the first floor of the brick funeral home, be converted to apartments. As a result, new windows were installed on the building’s rear elevation to provide light to residential units. Historic terrazzo floors were exposed and restored. Much of the work took place in the 1950s garage connector. The garage doors, which span the entirety of the connector, were kept, although some were minimally altered, as can be seen in the before and after photographs. 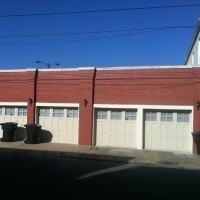 While the altered garage entries remain almost identical to their original appearance, their central panels now serve as pedestrian doors.